A new map details how many companies across the world have been infected by malware by the National Security Agency’s team of hackers, and where the companies are located. Dutch newspaper NRC Handelsblad reports the NSA uses malware to infect, infiltrate and steal information from over 50,000 computer networks around the globe. 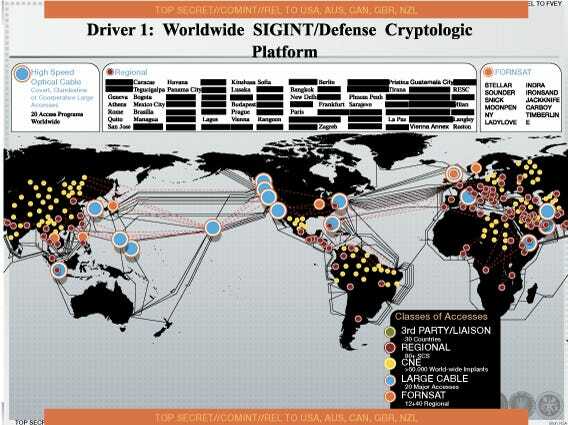 This new, previously unreported scope of the NSA’s hacking operation comes from another PowerPoint slide showing a detailed map of every infection leaked by former contractor Edward Snowden. We are exposed to countless pollutants on a daily basis in our food, air, water, clothing, and homes. And while many of them are known to be toxic, the consequences of low-level exposure are largely unknown. Despite the FDA and EPA claiming safety for the small amounts of contaminants we’re exposed to, a recent study indicates that long-term, low-level exposure to food contaminants could result in an increased risk of chronic diseases associated with metabolic function like diabetes. If you eat right and exercise but are still unable to improve your health, these low-level toxins could be to blame. Researchers studied two groups of obese mice—both receiving a diet of high-fat and high-sugar content. One group also received a “cocktail” of pollutants at a low dosage from pre-conception to adulthood. Those mice experienced unforeseen health effects. And when are we going to wake up? An outstanding ban on artificial water fluoridation has been upheld in the Australian coastal town of Byron Bay, located in New South Wales, following a heated encounter among local residents, scientists, dentists and city officials. The Fluoride Action Network reports that the Byron Shire Council ultimately ended up voting five-to-three to uphold the fluoride ban, relying on modern science which shows that fluoridation is both harmful and ineffective. The National Security Agency conducted widespread surveillance during the 2010 G8 and G20 summits with the blessing of host country Canada’s government. Documents supplied by former NSA contractor Edward Snowden show the US converted its Ottawa embassy into a security command for six days in June 2010 as world leaders met in Toronto. The covert operation was known to Canadian authorities, CBC News reported. Ultimately, the documents obtained by the CBC do not give exact specifications of CSEC’s role, if any, in the Toronto spying. Former Guardian reporter and Snowden’s chosen journalist to receive the NSA documents, Glenn Greenwald, co-wrote the story for CBC. Live beyond the limitations of self.